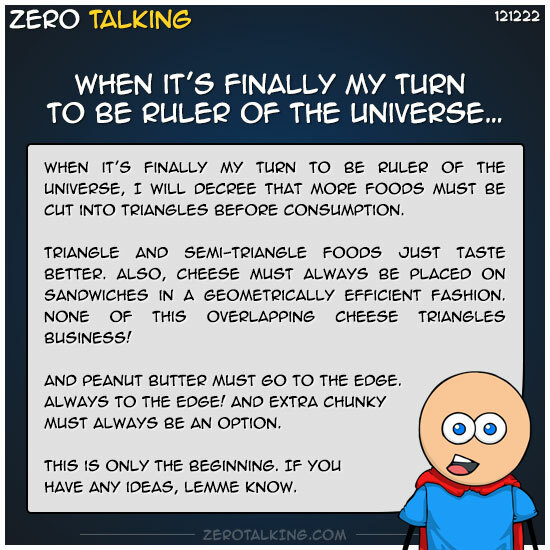 When it’s finally my turn to be ruler of the universe, I will decree that more foods must be cut into triangles before consumption. Triangle and semi-triangle foods just taste better. Also, cheese must always be placed on sandwiches in a geometrically efficient fashion. None of this overlapping cheese triangles business! And peanut butter must go to the edge. Always to the edge! And extra chunky must always be an option. This is only the beginning. If you have any ideas, lemme know.